Slide-Lok's Slat-Wall System is the perfect solution for your garage organizing needs. Slat-Wall is made of strong, durable material, can be custom sized to fit almost anywhere, include 7 accessory hook and baskets, and include an attractive wood grain or gray finish. We offer two Slat-Wall baskets to aid your storage needs. These are great for small gardening or home improvement items. 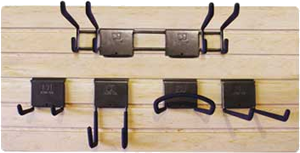 We offer five highly functional hooks that will meet your Slat-Wall hanging storage needs.